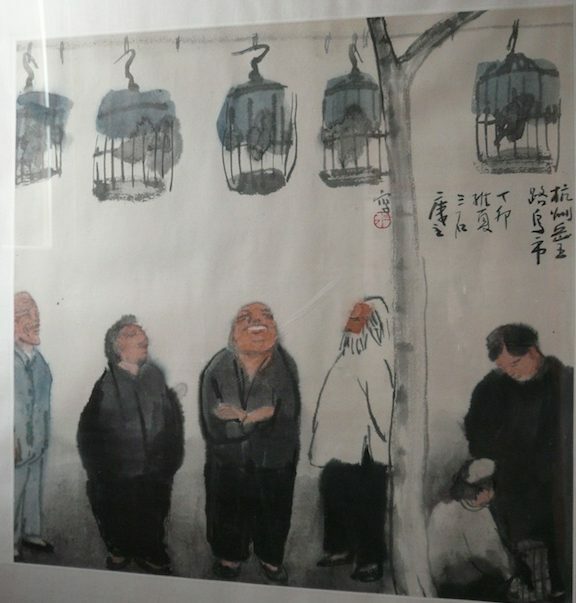 Painting inspiration – “Bird Market in Hangzhou” by the Chinese painter, Zeng Mi. His birdcages portray a great sense of joy and remind us of the beautiful bird markets in Hong Kong, where we used to live. Here is Jean’s version of hanging birdcages. 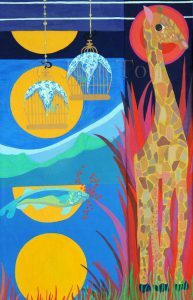 Yes, that’s a giraffe – Jean can’t exactly explain what inspired her to paint the long- necked animal, but once she’d finished it, then came the idea to have it juxtaposed next to the long panel with the sun, birdcages and fish. You can see the joint, especially where the long grass was painted over. Often spontaneity and irony have their say in the creative process!